While I am certainly no Yiddish maven, I know enough words and phrases to know that when someone mispronounces a Yiddish word it hurts my ears. For my maternal grandmother, who is fluent in Yiddish, when someone mangles the language of our eastern-European ancestors it really hurts her ears. So, the other day when I heard Rep. Michele Bachman on Fox News attempt to pepper her kvetching about President Obama with a Yiddish word, I just figured that her botching of the Yiddish must have rendered my grandmother legally deaf. Certain Yiddish words and phrases (Yiddishisms if you will) have entered the English language and should be treated as regular words. Maven, macher, kvetch, heimish, shtick, schlep, shpiel, klutz, nebish and kibbitz no longer require italics because they're used routinely in English conversation. This means that they should be pronounced correctly. Now, I don't expect non-Jews to be able to get out the guttural "ch" sound (as in Bach) when it comes to words like Chanukkah, l'chayim or tuchus. But at least pronounce them with the "h" sound rather than the "ch" sound as in Cheney or choo-choo. 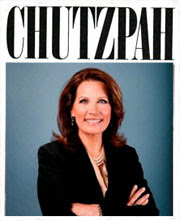 Michele Bachman's failing attempt to pronounce the word "chutzpah" correctly last week was nothing short of ignorant. The Think Progress blog summed up Michele Bachman's "Yiddish fail" this way: "Like many of her GOP colleagues, Rep. Michele Bachmann (R-MN) has positioned herself as a staunch defender of Israel and friend of Jews everywhere against President Obama’s supposed lack of Jewish support. But she ran into some trouble while trying to trying to show off her Yiddish skills on Fox News last night, pronouncing the word “Chutzpah” — meaning audacity — as “choot-spa.” As with “Chanukah,” the “ch” should be pronounced as an “h” sound, but apparenly Bachmann missed that lesson in pandering school." Jon Stewart obviously couldn't let Bachman's gaffe go by without making fun of her. The host of the Daily Show deadpanned: "Choot-spa... it sounds like she's talking out of her Tu-tzis!" Yiddish really is a wonderful language. The fusion of Hebrew and German yields many clever words and phrases, blessings and curses. While many Jews no longer speak Yiddish, it is no longer a dying language either. The Yiddish Book Center in Amherst, Massachusetts and dozens of Yiddish departments at universities around the world are ensuring that the Yiddish language continues. Throughout the country there exist Yiddish clubs made up of young and old Yiddish enthusiasts who enjoy speaking Yiddish. In fact, the 14th conference of the International Association of Yiddish Clubs is taking place at the end of this summer right here in the Metro Detroit area. I love when old Jewish men ask me if I speak Yiddish. "Redstu Yiddish?" they ask and I respond, "A Bissel." I then throw out the handful of Yiddish phrases my grandparents taught me that are mostly things grandparents tell kids when they complain of boredom (Like "Go knock your head against the wall!"). I'm glad that so many Yiddish words are now a part of everyday English. I just hope politicians like Michele Bachman make sure they hear the word pronounced before attempting to use it. Oh well... zei gezundt! R'Jason - are you saying that our presidential candidates should be able to pronounced Yiddish correctly to qualify for the presidency? Or are you saying that Chutzpah is so much a part of the English language that the proper pronunciation should be known? I am far less worried about a potential candidate for the presidency mispronouncing a Yiddish word than I am by a president who has on more than one occasion pronounced "Navy Corpsman" (Core-man) as "Corpse man". Now THAT'S ignorant, especially for our Commander in Chief! And Bachman's "Hootspa" pales in comparison to Obama's ignorant reference to all 57 States. Arthur, Obama's corpse-man comment was bad. But I don't blog about politics per se. I blog about things in the news related to Judaism and a presidential candidate botching a Yiddish word like Bachman did is blog-worthy for me Arthur. Don't read into it. If Pawlenty did it, I'd blog about that. If Biden did it, I'd blog about that. Hoot-spa made be more widely used, but it is no more correct than choot-spa. This whole issue seems rather petty and desperate. I'm more concerned about the candidates' policies toward Israel, and in that respect, Bachmann is obviously preferable to Obama. I happen to first hear about Michelle Bachmann's chootspa - that is why I always denote the Hebrew het letter with an h- in the midst of a weeklong seminar my husband and I attended at the Center of Jewish Studies in UW- dedicaed totally to the various facets of the Yiddish Language. The Yiddish professor suggested that most likely the speech was written for her by someone else who assumed that she knew how to pronounce the word which for some years now became part and parcel of the English Language. Obviously he was wrong. Perhaps the reaction to this mispronounciation is a bit much, however, it is indicative to the fact that person who wants to president is in disconnect with the reality of everyday speech. No longer Yiddish, can't you see? it is as English as can be? Now things will never be the same. I don't care 2 cents How Michelle Bachman, or anyone else for that matter, pronounces Chutzpah. With all due respect, who cares, Rabbi! What bothers me is, why even bring the subject up while remaining utterly silent on current presidential policies that attempt to intimidate Israel into concessions that could lead to a second holocaust.